Who’s got it better than the 49ers? Over the past two years, hardly anybody. The awarding of Super Bowl L to the team’s new stadium in 2016 is just the latest in a long string of good fortune for a franchise that was down on its luck for nearly a decade. The once-proud 49ers – who’d won five Super Bowls under coaches Bill Walsh and George Seifert – went eight straight seasons without a winning record from 2003-2010 before things turned around. But once the positive mojo started flowing again, it hasn’t stopped. The hiring of general manager Trent Baalke from within the organization. Though much talent already was in place, Baalke has proven to be a shrewd judge of talent and has been excellent in the draft. 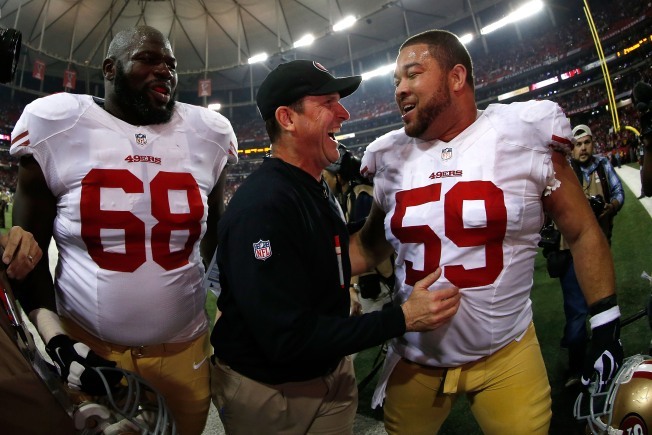 Baalke’s hiring of head coach Jim Harbaugh from Stanford. Drafting Nevada quarterback Colin Kaepernick in the second round of the 2011 draft, while also picking up an elite pass rusher in Aldon Smith in the first round of the same draft class, which was a remarkable one for the team. Back-to-back NFC West titles, two trips to the NFC Championship Game, one NFC title and one trip to the Super Bowl under Harbaugh in the past two seasons. Getting a deal to build a new stadium and securing a big-money naming rights deal with Levi Strauss. The 49ers have profited from a great staff of assistants put together by Harbaugh that has remarkably remained intact. Offensive coordinator Greg Roman’s offenses have been among the most creative in football. The 49ers getting great value for quarterback Alex Smith after he lost his job to Kaepernick. Finding a gem of a starting guard in previous backup tackle Alex Boone to help create one of the NFL’s best offensive lines. Collecting a great quantity of draft picks for 2013 and 2014 that should help keep the 49ers in contention for several years. As former 49ers head honcho Eddie DeBartolo noted during Super Bowl week, the franchise is flourishing once more under the direction of his nephew, York. The Niners are on a roll again, just as they were in the 1980s and ‘90s.